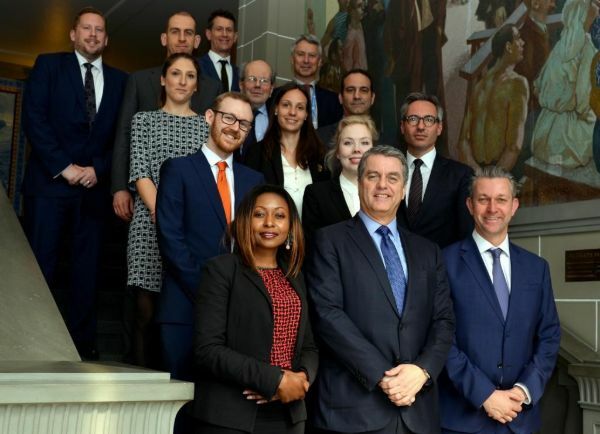 techUK Policy Manager Dr Thomas Goldsmith and the ICC UK delegation meeting with WTO Director General Roberto Azevêdo. 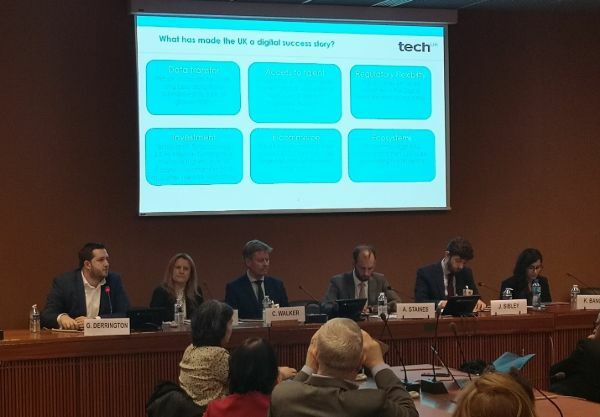 It has been a busy few days for techUK’s international policy team, who have been in Geneva for UNCTAD’s eCommerce Week. With seventeen different meetings, panels, events and dinners squeezed in, including our own panel with the Federation of Small Businesses, we’ve been representing the UK’s thriving tech sector and making the case for the importance of digital trade. Having grown from a small event with dozens of experts, to one bringing over 1500 delegates from around the world, eCommerce Week has established itself as a headline event in the Geneva calendar. It is even more in the spotlight this year due to the start of e-commerce negotiations. At the margins of the World Economic Forum in January, 76 WTO members announced the commencement of formal talks on a new agreement on digital trade. The biggest takeaway for me from this week was how much importance countries are placing on these negotiations. In part that is out of the importance of digital trade in and of itself. With the WTO estimating that the global e-commerce market is worth a staggering US$27.7 trillion, it is certainly time to update the rules on trade to reflect its importance to the world’s economy. But there is a wider context at play. The WTO is under strain thanks to the US blocking of appointments to the WTO’s dispute resolution panel, due to wider criticisms about how it handles other issues like subsidies and state-owned enterprises, and because of frustration at the deadlock in its negotiating function. For many countries, the e-commerce negotiations offer a roadmap for the WTO in the future. By bringing together a subset of the membership keen to make new commitments, these talks can kickstart a new round of trade liberalisation which had been stalled for years. Associate Director of Policy, Giles Derrington, speaking on the techUK-FSB panel. Given all this attention on e-commerce, it is going to be very important that the tech industry is engaging in the process. If an eventual agreement is going to be commercially valuable, it will be because the tech sector is clear in its priorities both in capitals and in Geneva. Both at eCommerce Week, and at the WTO’s Public Forum last October, techUK has been beginning this conversation. From expanding the Information Technology Agreement, which would ensure more waves of innovation can benefit with tariff-free access to markets, through preventing data localisation and enabling data flows, to ensuring the moratorium on digital tariffs becomes permanent, we’ve been delivering messages of our members priorities. The UK can play an important role in this going forward. Regardless of Brexit outcomes, the UK can bridge differences in a way that few other countries can, whether between the differing approaches of the US and Europe, or with China. The UK’s excellent team in Geneva are already closely involved in the talks even if not currently as a separate negotiating party. But industry will need to continue to step up. There is demand for clarity on what would be commercially significant, and for examples of where there are barriers to digital trade. The tech sector will need to partner with Governments in this process if the momentum behind these negotiations will translate into results. techUK will be leading this effort for the UK.